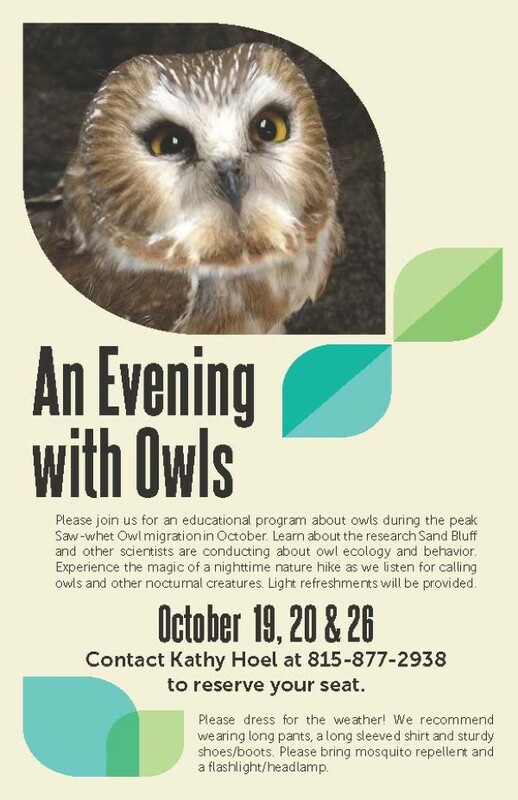 Please join us for an educational program about owls during the peak Saw-whet Owl migration in October. Learn about the research Sand Bluff and other scientists are conducting about owl ecology and behavior. Experience the magic of a nighttime nature hike as we listen for calling owls and other nocturnal creatures. Light refreshments will be provided. Please dress for the weather! We recommend wearing long pants, a long sleeved shirt and sturdy shoes/boots. Please bring mosquito repellent and a flashlight/headlamp. Contact Kathy Hoel at 815-877-2938 with questions.